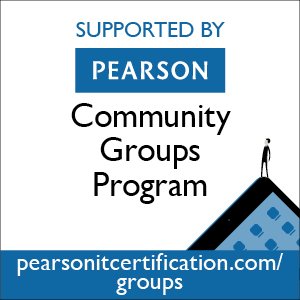 Welcome to our Pearson Community Groups Program, providing Pearson IT Certification user groups and communities with discounted prices, product news, review copies, marketing materials, and giveaways. Pearson IT Certification is a member of the InformIT Network, and all registered user groups across the network participate in the Pearson Community Groups Program. Once you register your User Group, Pearson IT Certification will verify your information and you'll be provided with our member URL, which has the discount code included. Leaders can use complimentary copies—for either print or digital products—to help boost meeting attendance through giveaways, assignments to committed reviewers, additions to group libraries, and/or we encourage your own creative ideas! Let's Get Started—Register Your Group! We love to see what your community is up to—send your meeting pictures to community@informit.com. All photos must be JPG files with a maximum width of 300 pixels; 72 dpi is preferred. By submitting your photos, you are giving us permission to use them in our marketing channels. Questions? Email community@informit.com. Please include your full name, user group name, and URL in the message.